But her story remained consistent and her smooth exterior never once betrayed a glory-hungry monster within. So, I started to believe that there wasn’t one. According to the ASP’s World Tour manager, Al Hunt, the closest world title race in history was in 2001, when just 30 points separated Layne Beachley from Melanie Redman-Carr. Carissa Moore ultimately won the 2013 race by 3,800 points, a fraction of her 59,000-plus point total. Heading into the last event, there were only 200 between the pair. It still ranks among the tightest world title clashes ever. Levity is of paramount importance to Tyler. Whenever she mentions someone whose company she enjoys, that person is invariably “funny.” And Tyler is funny. She has a salty sense of humor and the ability to laugh at herself, which are definitely assets in the world of competitive sports. Brooke is a former WCT surfer herself and she was at Layne Beachley’s side while she was racking up titles as if they were going out of style. Now, she’s Rip Curl’s international events and girls’ team manager. She and Tyler have a connection that far surpasses the typical surfer-manager relationship. Tyler’s Rip Curl family is about as close as her immediate one, and Brooke seems to play the roles of manager, mother, sister, coach, and friend. More and more of the Top 17 are traveling with partners these days, but a hunky pro-surfer boyfriend is not a part of Tyler’s entourage. Like any 20-year-old, she is interested in dating, but she hasn’t really had the time. She recently met an interesting guy, at her aunt’s 50th birthday party, but claims she was “too much of a chicken to ask him out on a date.” Apparently, making the first move is always scary, even for girls who charge waves like P-Pass. In 2010, I was trying to recruit Surfer Poll voters and some guy said, “You know who’s really good? Owen Wright’s sister? Tyler. Yeah, she rips.” And he voted for her on the spot. At the time, she had won two World Championship Tour events, both as a wildcard. 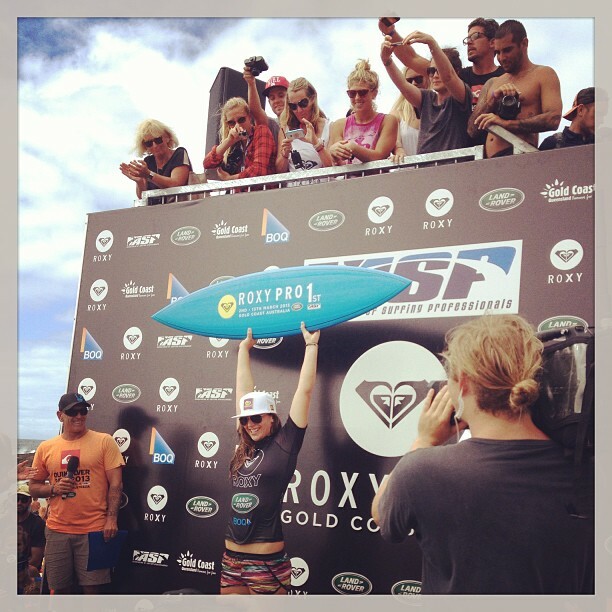 One of which (the 2008 Beachley Classic) made her the youngest surfer ever to win a CT event. She was just 14 at the time. At 16, she wasn’t on Tour yet, but she was already gaining international recognition. That year, she qualified and she finished her rookie year at 4th in the world. Tyler doesn’t always offer up smiles or verbose quotes in her post-heat interviews. She often eschews the competitors’ area at contests, preferring the ironic privacy of the beach. It would be a mistake to interpret this distance as coolness, because when Tyler “keeps to herself,” what she’s really doing is keeping careful company. In fact, she is rarely alone, and when she’s amid her cohort, she’s affable and warm. More to the point, she’s unfailingly no one except herself. While she is poised, she is never contrived. Many professional athletes skillfully mask their negative emotions–worry, disappointment, anger. Tyler Wright doesn’t bother. But negativity also seems to elude her much of the time. “Regimen” isn’t really a word that Tyler uses for her self-imposed diet and exercise routine. “Flexible” is. But that doesn’t mean the girl doesn’t train, and train hard. It just means that she doesn’t do it solemnly. Dessert played a central role in Tyler’s 2013 [non-]campaign. At each event, there was (at least) a mention of cake, cookies, or éclairs. Tyler says she doesn’t actually handle sugar that well, but she loves good food. Growing up, Mumma Wright made sure that her kids always ate natural foods, and most of the time, Tyler still does–especially when she’s training. She describes herself as “moody” with regards to food, and her diet is usually dictated by how she feels. Tyler says that when she was younger, she didn’t fully appreciate all of the places to which surfing took her. Now, she tries to make the most of every destination. On this trip to Portugal, Tyler rode horses at sunset, visited castles, and, naturally, ate pastéis de nata. The way she wants to surf just so happens to align, perfectly, with the way the judges (and we, the spectators) want her to surf. Classical power surfing and boundary-blurring progression are a compelling combination, and her success is proof of that. I also believe that people simply enjoy watching other people who enjoy what they do, and to watch Tyler surf is to witness something pure. Tyler can’t tell you how old she was when she started surfing; she just knows that she was very young. The whole family surfed and lived on the beach, so she fell into it naturally. And fell in love. A little more than a week after the curtain fell on the title race, Tyler is home in Lennox Head, New South Wales. Lennox is just south of Byron Bay, which is just south of the Gold Coast, and this stretch of sand produces a lot of impressive surf. Consequently, the region produces a lot of impressive surfers. Michael Peterson, Pete Townend, Mick Fanning, Parko, Adam Melling, and Steph Gilmore, to name a few. When T answers the phone, it sounds like she’s in a room with a lot of people. Her voice is expressive and choral, and, like any good Aussie, she drops consonants from the ends of words. It’s all very endearing. She’s just come back from building a snowman. Which is unusual in northern NSW. Especially in springtime. Well, she was meant to play a game of touch football, but it began to hail. So, lemonade. Whatever. T says “whatever” all the time–and not in the way that snotty teenagers say it. She really means that whatever happens is fine by her. On the off-season, Tyler’s day-to-day life really resembles anyone’s. Well, maybe anyone’s Saturday. It always includes a good breakfast, a surf (or four), and time with family. It often includes motorbikes, puppies, dance parties, and good books. T loves her books and says she has heaps of them. Right now, she’s in the thick of four series. When she says this, I can’t help but think of the way 2013 turned out for Tyler. Second wasn’t the place that much of the world wanted for her. But second in the world is, by no means, a sad ending. And then it occurs to me that this was exactly the ending that Tyler had written for herself, for that season. All she ever hoped to achieve was authenticity. Adherence to her own rules. And she succeeded. I ask Tyler how she would describe herself and after some hesitation, she finally says, “I guess sometimes, I’m moody. Sometimes, I’m funny. Sometimes, I’m just a dork. But… I have no idea, actually, how I would describe myself. I’m just me. What you see is pretty much what you get.” And then she laughed. This is not an ending at all. *Another one of my favorites that never found a home. Tyler is a really amazing human–feel free to share!